Time Zone: Wyoming and Montana are on US Mountain Standard Time (MST), 7 hours behind Greenwich Mean Time (GMT-7). Both states observe Daylight Savings Time. Though the parks are very popular, especially in summer, it's still possible to find yourself far from the crowds, watching hundreds of buffalo crossing the plains as they did centuries ago. 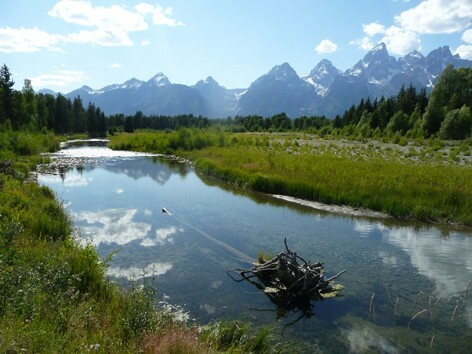 Many of the villages and lakes are named for the rugged frontiersmen who explored the area, and one can imagine their astonishment when they first witnessed Old Faithful's 180-foot plume or saw the Tetons reflected in a lake. The parks are well worth visiting on their own, but we recommend seeing both if you have time. Though they border one another, each park has its own distinct character. Grand Teton National Park has a quiet majesty and seems relatively intimate and compact, while Yellowstone impresses with its vastness and power – it’s literally a massive, active volcano, and feels very alive. Both regions are quintessentially American and yet one of a kind, and they are not to be missed.